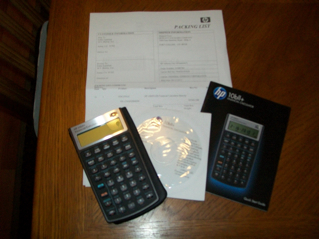 This is the review of the Hewlett Packard HP 10bii+ financial calculator. The HP 10bii+ is a substantial upgrade to the HP 10bii. Hewlett Packard finally utilized the keyboard to its fullest, adding many functions such as depreciation, probability distribution calculations, bonds, expanded statistic capabilities, and depreciation just to name a few. For this review, I have worked out all the examples prescribed in the manual provided. I also worked some of the examples with other finance calculators (10bii, 12c, 17bii+, 30b) just to see if the calculators have consistent answers. I am happy to report that the 10bii+ is consistent with the other financial calculators. As for speed, I would state from the testing I did so far, the speed of the 10bii+ is pretty much on par with the 12c (two-battery edition) and the 30b. The colors on the keyboard are nicer and brighter than its predecessors. I can actually see the blue shifted functions in all levels of light and angles. The keys are tactile and easy to push. No missed keystrokes during normal operation. Thankfully, the HP 10bii+ it can take a spill and clean up easily, and no, I did not plan that. I was able to clean the calculator immediately and it works in perfect order. The 10bii+ sports 20 memory registers: 0 through 9 and .0 through .9. Store arithmetic is provided, but not recall arithmetic. There is a dedicated M register with three keys dedicated to it: →M (store to M), RM, and M+. I really like this feature, which allows me to calculate a sum of a large amount of numbers. The M register has been a feature on the 10b series since the beginning. * Up to 45 cash flows can be stored. * Up to 45 data points can be stored - if you want the full statistical features of the 10bii+. There is a catch though. The 10bii+ allows space dedicated for 15 cash flows and 15 data points. There are 30 slots that are shared between cash flows and data points. Once the slots are filled, and you will no longer be able to store cash flows. However, the manual states that you can continue to add data points at a cost: you can no longer review data points and the only have linear regression available. More on cash flows and statistics later. One nit picky point, the STO function is still a shifted function (orange). Personally, I like STO to be a primary function (unshifted), but no big deal. You can also recall mostly anything by first pressing RCL then the variable or storage register you want. * The factorial function now serves ALL real numbers from -252.999999999 (nine 9s) to 253.119. I like this a lot, became the gamma function is one my favorite functions. Γ(x) = (x - 1)! * Random Numbers from 0 to 1. * Radian and Degree modes, but not angle conversions. The 10bii+ offers to operating modes: Chain or Algebraic. Chain mode is obvious: any operations act immediately on the displayed number. Order of operations are ignored. The Algebraic mode is not of the "enter the entire expression and then press enter" type. For one argument functions, enter the number first then press the function. I wish HP would have implement RPN (Reverse Polish Notation) mode - even if the mode just turned the left and right parenthesis into swap the x and y registers (x<>y) and roll the stack down one level (R↓), respectively. Last Answer... and a Bug? The 10bii+ offers a last answer feature, which is new to the 10b series. The last answer is what was in the display when the equals key (or any key that finishes an operation, I think) was last pressed. The last answer can be accessed by pressing RCL =. My guess is that pressing INPUT also loads the displayed number in the last answer register. The 10bii+ presents two ways to work with two argument commands: use of the INPUT, and the direct, "in-line" way. The INPUT way is the classic way in the 10b series: number or operations, INPUT key, number or operations, function key(s). The direct way is: number, function key(s), number, = key. Personally, I prefer this method - more straight forward. You get the option with: combination, permutation, Student's t Distribution functions, percent change, DATE function, days between dates function. The time value of money keys on the 10bii+ work (nearly) exactly like the time value of money keys work on any other HP calculator. The interest key (I/YR) works with annual interest rate (the 12c series work with the periodic interest rate). Solving time value of money problems are straight forward: enter the known amounts, press the variable to be solved for by just pressing the key. No compute key necessary. For those of you new to HP financial calculators, Chapter 5: Picturing Financial Problems and Chapter 6: Time Value of Money on the full manual provide an excellent introduction and a good set of practice problems regarding time value of money. New: a dedicated clear time value of money function. No more C ALL required - nice! Calculations regarding cost, price, margin, and markup follow the model of the time value of money application. Enter the known information, then press the key of the desired variable to solve for it. At first glance, it looks like the cash flow application was untouched. Not so. This application is updated - BIG TIME. Next, like the time value of money registers, there is an all important clear cash flows sequence. Third, when net present value (NPV) is calculated, you also calculate net future value (NFV). NFV is accessed by the SWAP function after NPV is calculated. Finally, we can now review cash flows and their frequencies. This is done by simply pressing RCL CFj. Cash flows and frequencies can be reviewed, added, inserted, and deleted. If you are familiar with the bond functions on the 12c, them you should at home with the 10bii+. There are separate storage registers for Settlement Date, Maturity Date, Coupon Rate, and Call Amount. You can calculate the price of the bond, yield to maturity, and the accrued interest. With many dedicated keys to bonds, you can keep track of what each variable contains. The breakeven application is similar to the time value of money application. Enter amounts for the known variables then solve for the ones you want. The depreciation functions calculate the year's depreciation, and the remaining book value. The functions only work in whole years - meaning you will not be able to set up the first month. If you want to work with non-integers (say the asset has 5 1/2 years), you can calculate the first five years, but the calculating the sixth year returns 0. A possible work around in this Case is to use the remaining book value from year 5 as the 6th (and final) year of depreciation. The statistics application is similar to the cash flow application. You can review entries and edit them, there is a clear data points sequence, and you can easily find the most common statistics measurements (mean, deviation, sums). The variables m, b, and the correlation coefficient (r) can be found by pressing the orange shift, the appropriate key, the orange shift key again, and then swap. The 10bii+ also features best fit (Regression 0). However, to find which regression fit the data points better, you will have to attempt to either predict x or y, or calculate a weighted average. One thing that can be improved is that the 10bii+ actually stating the best fit when it is activated. The 10bii+ also has lower tail normal distribution and Student's t distribution CDF function and their inverses. I think labeling the distribution functions LTND (lower tail normal distribution) and Student (lower tail student's distribution) may have been better than z <>p and df,t <> p , respectively. But it works, and works well. * The ability to review and edit cash flows and data points. I would recommend purchasing the 10bii+. It is a very solid calculator good for the entry level while having a lot of easy to use finance applications. Hewlett Packard has stepped up their game by updating the 10b series. First of all, thanks for the review. My name is Leonardo. I live in Brazil. My first HP’s calculator was a HP 20S (made in Brazil), bought in 1991, still working. I’m not from the financial sciences (actually, I’m a Government worker, graduated in Law), but, since 2010, I’ve bought some HP’s finance calculators just for hobbie: two HP 10BII (the latest model before the new HP 10BII+), one HP 17BII+ (silver model), one HP 20B, one HP 30B and one HP 12C Gold (new model, with two batteries). The three last models, I bought lass than two weeks ago. I have to confess that, until now, I’d rather to work with 10BII, but I’m quite impressed with HP 30B’s and HP 20B’s velocity. My HP 12C (new model) arrived today and I also have to confess I’m a little bit disappointed with it’s velocity in some points. Just no to be misunderstood: I’ve already realized it’s faster than my 10BII, but, at least for finding some margins and amortizations, it’s slower than the 20B and 30B ones (in some cases, very slower). By the way, cash flow, in the new 12C, has the loop limited to 99 (as the 10BII and the old 12C), and it’s not possible two find 12.3! (for exemple, as I can do with 20B and 30B), nor a number superior to E99. One more question: I’ve already notice that HP 17BII+, in works with really big numbers and big periords, show less precision than the ‘old’ HP 10BII (although, at least in the Brazilian manuals, HP tells us that HP 10BII has 12 digits internal precision and HP 17BII+ has 12 up to 31, depending on the operation…). And I’ve already notice that, in the same circumstances, HP20B and HP30B are really more accurate in this point, showing, in many cases, balances equal zero (while HP 10BII and HP 17BII+ shown another results). About the precision (working with big numbers and big periods of time), have you notice some difference between HP 10BII+’ and HP 30B’ results? Just to finish: in cash flows, are still there the HP 10BII’s ‘cj(n)’ limit (99) or can we work with big ones, like in HP20B and in HP30B? Once again, I appreciate your review and apologize for my bad English! I tested some TVM with large number of periods and I am pleased to say that the 10bii+ can amortize more than 999 periods. It does not look like there is a limit, but I could be wrong. I tried amortizing for 1,000 periods, then 1,825, then 3,650 (for a loan lasting 10 years with 365 payments a year); all without a hitch. I hope this what you are looking for. As for the cash flow frequencies, I know we can have up to 45 cash flows, but the manual does not state the limit of frequencies (yet). So yes, you can go over 100 for frequency, apparently there is no limit. Something to keep trying. I can't wait to get a new HP 10BII+! Have a gread day too! Awesome calculator and through explanation Eddie.Thanks for sharing this valueable information here. There are other Fiancial Calculators, like SIP Calculator which can help you in knowing how much you should invest in order to achieve your financial goals. I have a problem here. I just bought HP 10BII+ which I think I bought wrongly for my class because I couldn't get the same answer just like in my lecture notes. My friend got it right with her HP 10BII. The question is about time value of money. About compound interest. Finding for the future value. Present value is $100. Interest rate is 5%. Period is 5 years. Payment is $0. The answer in the lecture note is $127.63. Whereas, the answer that I get from my financial calculator is $102.10. Why is it like that? Cindy ~ You have to set your payments per year to "1" instead of 12. Hi Eddie, since it sounds like you've put the HP 10Bll+ and 30B through their paces, which would you choose as the best overall calculator for real estate business use? And between these two, the better overall calculator? Apart from having a few bugs which is very uncommon for HP calculators this is a really nice tool for every day use. Agree. The 10bII+ is a serious upgrade to the 10bII line. HI: I have new 17BII+ had this following program in solve now it gives me "invalid equation". Can you help? I just want your advise which one should I buy. Thank you for your detailed review. It helped me a lot.